Researchers have discovered the scientific basis of why Rudolph the red nosed reindeer's nose is red. 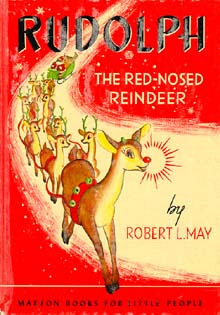 Rudolph the red nosed reindeer was created by Robert L. May. He first appeared in a 1939 booklet published by Montgomery Ward for its Christmas giveaway promotion. Prior to the booklet, Montgomery Ward was giving away coloring books and it was more economical for them to publish their own booklet. Montgomery Ward was reported to have distributed 2.5 million of the booklets that year alone. The book featured the familiar story of Rudolph and how he became the lead reindeer of Santa Claus' sleigh. Approximately ten years later, the song Rudolph the Red Nosed Reindeer was recorded and since then has become one of the most popular holiday songs. The song was written by Johnny Marks, who was May's brother in law. The song was first sung commercially by Harry Brannon on November 1949 before Gene Autry's recording came out that same year and became the number 1 song for the holiday season. Rudolph has since been considered a Christmas icon next in popularity to Santa Claus. The embedded video below is a cartoon based on the original story of May. This version is the reissued version with the popular song inserted. It is written by Robert May and Joe Stultz, and directed by Max Fleischer. Rudolph's nose is red because it is richly supplied with red blood cells which help to protect it from freezing and to regulate brain temperature. This superior "nasal microcirculation" is essential for pulling Santa Claus's sleigh under extreme temperatures, reveals a study in the Christmas issue published on bmj.com today. Tiny blood cells (known as micro-vessels) in the nose are vital for delivering oxygen, controlling inflammation, and regulating temperature, but few studies have assessed their function in detail. Knowing how important this regulation is for flying reindeer, who have to deal with extremes of temperature while pulling a sleigh, researchers in the Netherlands and Norway set out to test whether Rudolph's infamous red nose was due to "a highly dense and rich nasal microcirculation" compared with human noses. Using a hand-held video microscope, they first assessed the noses of five healthy human volunteers and found a circulating blood vessel density of 15 mm/mm2. When the technique was applied to two reindeer noses, the researchers found a 25% higher density of blood vessels, carrying a super-rich concentration of red blood cells. They also found a high density of mucous glands scattered throughout the reindeer noses, which they say helps "maintain an optimal nasal climate during changing weather conditions and extremes of temperature as well as being responsible for fluid transport and acting as a barrier." Infrared thermal images showed that reindeer do indeed have red noses. "The microcirculation of the nasal mucosa in reindeer is richly vascularised and 25% denser than that in humans," say the authors. "These factors explain why the nose of Rudolph, the lead flying reindeer employed by Santa Claus to pull his sleigh, is red and well adapted to carrying out his duties in extreme temperatures."